Take your dog to a book store! Join Dog Squad authors Laura T. Coffey, Waverly Curtis, David R. Gross, and Tracy Weber for an afternoon of Fido fun! All four authors will read from their books, answer questions, and accept dog kisses. Come prepared to share your dog’s special talents. Who knows? Maybe your pup will be featured in one of our future books. Readings, signings, prizes, and dog treats! What more could you ask for? Laura T. Coffey is a writer, editor and producer for TODAY.com, the website of NBC’s TODAY show, and the author of the non-fiction book “My Old Dog: Rescued Pets with Remarkable Second Acts.” An award-winning journalist with more than two decades of experience, Laura has written and edited hundreds of high-profile human-interest stories. She lives in Seattle. Her author website is http://www.myolddogbook.com/. Waverly Fitzgerald and Curt Colbert make up the writing team known as Waverly Curtis. In 2011 when Curt showed up for one of their weekly meetings with the start of a novel within a novel featuring a talking Chihuahua. Waverly said she would like to help him write that novel (especially since it was loosely based on her daughter’s Chihuahua, Pepe) and the collaboration was born. Five years later they’ve written five novels and one novella in the Barking Detective series for Kensington books; the most recent is called The Silence of the Chihuahuas. David R. Gross graduated from Colorado State University’s veterinary school in 1960. Following private practice for ten years he enrolled in graduate school and earned a M.Sc. degree and a PhD degree from the Ohio State University. He taught and did research at Texas A & M University for sixteen years then became Director of the Cardiovascular and Thoracic Surgery Research Labs at the University of Kentucky Medical School for five years. Dr. Gross retired in 2006 after twelve years as Professor and Head of Veterinary Biosciences, University of Illinois, Urbana-Champaign. Since retirement, he published: ANIMALS DON’T BLUSH (Book Publishers Network), MAN HUNT (Whiskey Creek Press), SUCCEEDING AS A STUDENT (Book Publishers Network), and TRAVELS WITH CHARLIZE (Book Publishers Network). He blogs at http://www.docdavesvoice.com. This entry was posted in dog books, dogs, Downward Dog Mysteries, writing on January 25, 2016 by Tracy Weber. 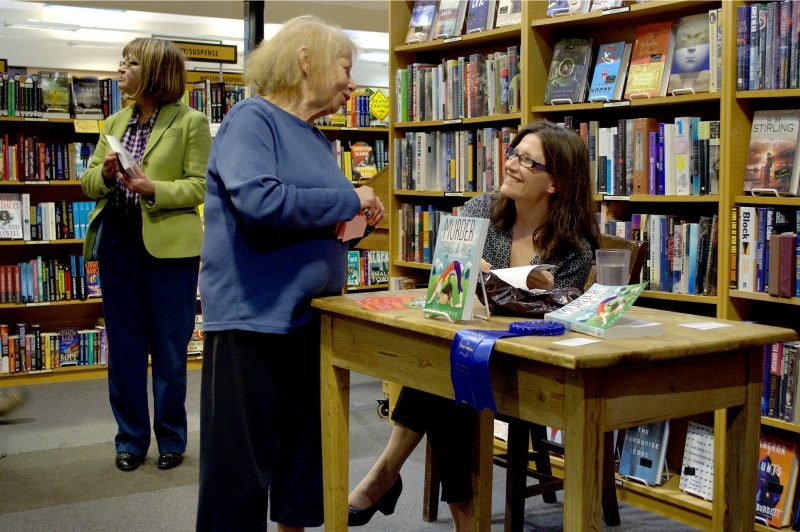 I’m having a fabulous time on my virtual and in-person book tours! Seattleites, come see me this week at Third Place Books in Lake Forest Park on Thursday at 7 PM or at Whole Life Yoga this Saturday at 2:30! Readings, prizes, signings, and all the hugs you’ll give me! Both events are open to all ages, so bring the whole family! The awesome Rene de los Santos will be present at the Third Place Books event to teach a short chair yoga class to prepare your bodies for sitting and your minds for reading! This entry was posted in dog books, dogs, Downward Dog Mysteries, writing, Yoga Books on January 18, 2016 by Tracy Weber. Happy Book Birthday! Come Give Me a Hug! My third written child was officially released on last Friday, January 8, and the busy push of parties, appearances and publicity will soon take over my life for a month. Who knew that writing the book would the easy part! Below is a partial list of upcoming events and recent articles. I hope to see you at a book signing soon! Facebook Launch Party! According to Facebook, almost 250 people attended the event from all over the US and as far away as Australia. Even though the party is officially over, you can still check out the site to find excerpts, photos, games, and questions. Check it out and join us live next year! That’s just a sampling, and lots more is scheduled to happen the rest of this month and in February. Stay tuned, and please check out the series, and please come give me a hug at one (or more) of the events! 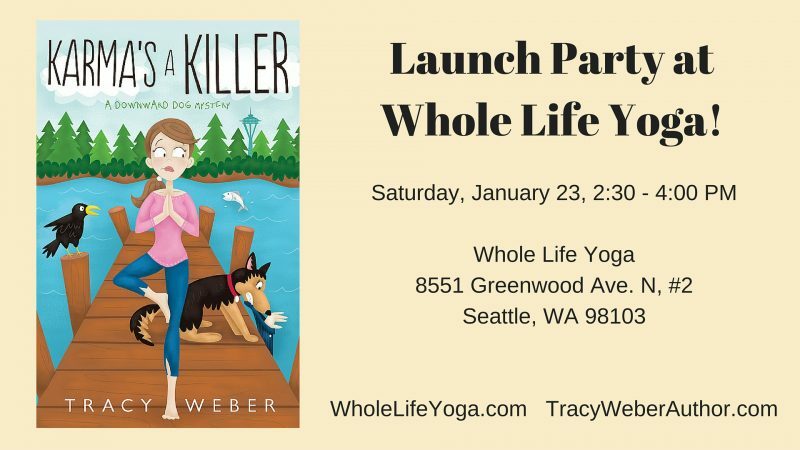 This entry was posted in dog books, Downward Dog Mysteries, Gratitude, writing and tagged book launch, karma's a killer on January 11, 2016 by Tracy Weber. Dedications, and Thank Yous and Acknowledgements, Oh My! Until I was a writer, I rarely read the acknowledgements section at the beginning of a book, but I know now that it represents the village of people it takes to write a novel. So, for your reading pleasure, here is a pre-view of the kudos coming when my book is released this Friday. I’m sad that my mom never got to see the dedication, but I was able to tell her about it before she passed. 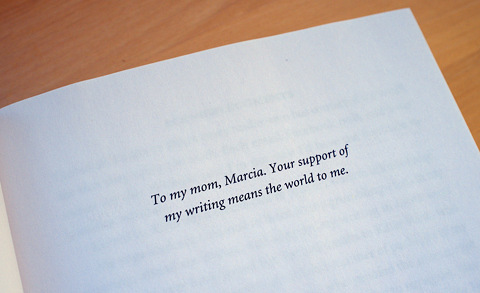 To my mom, Marcia. Your support of my writing means the world to me. First of all, I’d like to thank every reader who has contacted me to tell me that they enjoy my work. Each e-mail, Facebook post, and letter makes my day. Without you, I’m not sure I’d have the fortitude to continue writing. Karma’s a Killer has a special cast of supporters I want to acknowledge. My yoga students continue to listen to my grumblings, join in my cheering, attend my events, and support my writing in more ways than I could ever have hoped for. Special thanks to Katie West, who addressed and mailed a seemingly infinite number of packages to my street team members, and Katie Burns, who proofed the manuscript before I submitted it to Midnight Ink. Thanks also to my agent, Margaret Bail, editors Terri Bischoff and Sandy Sullivan at Midnight Ink, and freelance editor Marta Tanrikulu, who all continue to give me invaluable help and feedback. Special thanks go to Michael Westerfield, author of The Language of Crows. Michael graciously answered my many questions about crow behavior. His insights about crows raised as fledglings and released to the wild were invaluable. Of course, if there are any errors in this work—about crows or anything else—they are completely mine. My husband, Marc, and my real-life Bella, Tasha, continue to be the lights of my life. Anything I accomplish is only possible through their love and support. Marc gets extra kudos for designing and maintaining my author website. Tasha gets credit for introducing me to her crow friends and fueling my fascination for these intelligent, underappreciated creatures. Finally, thank you to all of my street team members. These dedicated individuals spread the word about my writing, pass out my bookmarks, and make me smile on days that otherwise seem glum. The best part of writing has been connecting with all of you. Purchase my newest mystery, KARMA’S A KILLER, now at Amazon Barnes and Noble, or a bookstore near you! 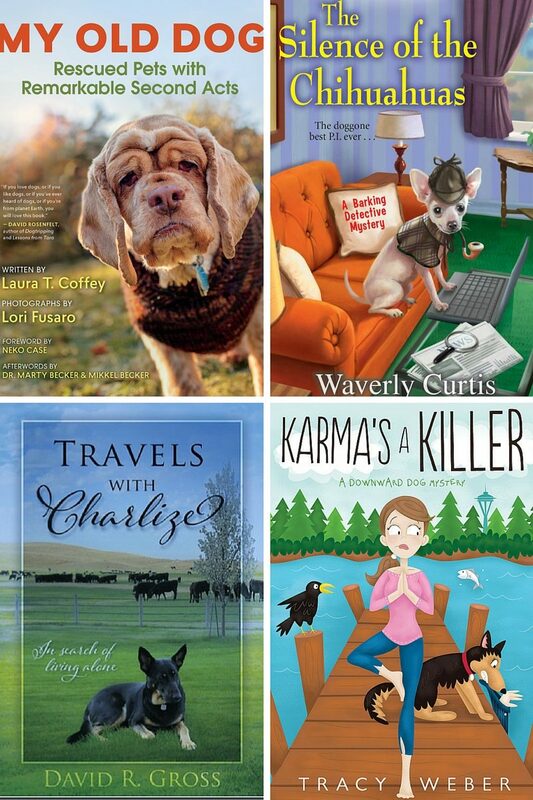 This entry was posted in Downward Dog Mysteries, Gratitude, writing and tagged Cozy, cozy mysteries, cozy mystery, dogs, downward dog mysteries, downward dog mystery, gratitude, holidays, karma's a killer, Tracy Weber, writing, yoga mystery on January 4, 2016 by Tracy Weber.